Customers expect free trials these days. They don’t want to commit to your subscription product or service without some idea of what they’re getting themselves into. But free trials aren’t free for you! Whether you invest time and labor or server costs, free trials can be quite expensive to offer. So you probably fret that your free trials don’t convert enough customers. According to one report, 80% of free trial users never convert to customers. For some companies, that figure is far lower. Experts say anything less than 25% means your marketing or onboarding needs work. Fortunately, simple changes can make a dramatic impact on your free-trial-to-customer conversion rate. In this article, we’ll outline six best practices that will boost your conversions. Struggling to convert those free users into paying customers? These tricks might help. The purpose of a free trial isn’t to introduce your customer to the product or service. It’s not to show off your cool features. So rather than use your free trial to walk your customer around your product, or to give them a sandbox to play in, it’s smart to use your free trial to walk your user to whatever point makes them comfortable paying for the product or service. What is that point? It’s obviously different for each product/service and customer, but you can identify that point by determining what your users consider value. Your next step is to design your free trial to drive your customer down a path to that moment of value. Once they realize the value of your product/service, there’s a good chance they’ll buy it. But if they never realize that value, they’ll abandon your product. For example, let’s say you have a tool that schedules social media posts. Your users sign up, naturally, to schedule their social media posts. Instead of leaving them hanging at the dashboard, your free trial should include an onboarding process that helps them schedule social media posts. That way they realize the value you provide. This is also an important strategy to build customer loyalty over time. There’s no precise free trial duration that applies to every product or service. Some simple products or services can get away with offering three- or five-day trials because the user only needs a few minutes to decide if they’ll buy. Other products need to give out long free trials for users to adopt the system. Generally speaking, it’s best to keep your free trial under a month. That’s usually enough time for potential customers to decide if they’ll become actual customers. Keeping the trial under a month forces the user to use it and make their decision soon. That said, don’t stick with a month because it’s what everyone else is doing. 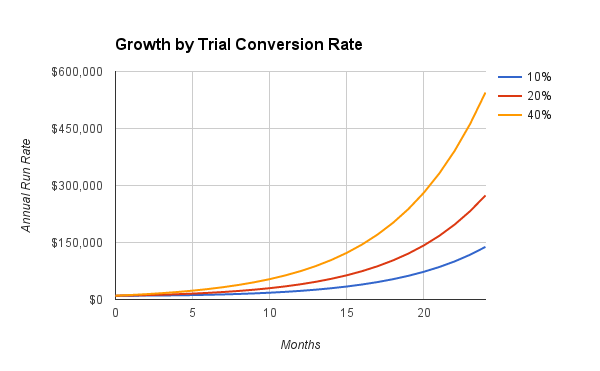 Experiment with free trial lengths to see which one converts the most customers. Other than giving users unlimited access to your product for a limited duration, another way to offer a free trial is let people use a limited version of your product for an unlimited time. Here are a few different ways to place limits on your product or service. Feature Limit – Disable features or functions for free accounts. Usage Limit – Limit how many actions users can take (e.g., emails they send, payments they process, times they log in, etc.). Capacity Limit – Caps on how much information they can store (e.g., 100 contacts, 2000 records, 1 TB of storage, etc.). Output Limit – Limit or reduce what they create with your product so it can’t be used fully (e.g., a watermark on produced images, license restrictions, etc.). What’s right for your product/service may be a mix of some of those limitations, or something entirely different. But don’t feel locked into the “30 days free” model. Even if your product or service inhabits a small industry or tiny niche, you still probably have multiple customer segments. Each segment has its own problems, needs, and preferences for a product or service like yours. Like we said a moment ago, the purpose of your free trial is to help your users realize value with your product. It’s smart, therefore, to design different versions of your free trial that appeal to each customer segment. That way you can make sure each customer achieves whatever they find valuable. How do you break customers into segments early? It’s as simple as one extra field to your sign up form. Alternatively, you could create a branching onboarding process where the first step asks the user in a straightforward way how they intend to use the product. For instance, you might add a field to your sign up form that asks for their company size. Depending on their answer, you could funnel them into a different onboarding process so your free trial meet their needs. This is especially important if your product or service has a lot of features or solves a lot of problems. Without segmenting your users, there’s a good chance your onboarding process wouldn’t show the value you can create for them. Many free trials make the mistake of waiting until the very end to ask the user to purchase the product or service. But you don’t owe them the entire free trial duration. It’s fine to ask for a sale as soon as you think you can get it. Remember that the purpose of a free trial is to deliver the user to the moment they first realize value with the product. That moment is the best time to ask for the sale, regardless of how long it took to get there. For instance, let’s say you have a customer relationship management tool that helps users close deals, and you define the first moment of value as the first time the user moves a deal from the “open” column to the “closed” column. This is the perfect time to ask them to buy. Furthermore, asking for the sale early give you the opportunity to figure out why they won’t buy. If they refuse to buy you can ask them why before the free trial is over. If you wait until the end of the free trial to collect feedback, there’s a good chance they will just move on from your product or service. If your customer is using your product’s free trial, there’s a good chance you aren’t the most important thing happening in their life. There’s a good chance they’ll forget about your trial and let their time expire. You need to reach beyond your product and create additional touchpoints with your users to remind them you exist. This could be as simple as sending a sequence of emails with deep links that push them along the onboarding process. If, for instance, they don’t engage with a particular feature within the first three days of the trial, send them an email prompting them to check it out. Or you might reach out to them with an email or phone call to introduce them to the feature personally. Your free trial conversion, like customer retention, is better solved as soon as possible. The longer you wait, more potential customers will slip through the cracks. Use the steps we outlined above to create a free trial program that maximizes conversions. Need a way to collect payments for subscriptions after free trials? You don’t need a complex system. With WP Simple Pay and Stripe, you can quickly and easily set up subscription products with free trials. Learn more. Struggling to convert those free users into paying customers? These tricks might help. Subscribe to receive this free resource.